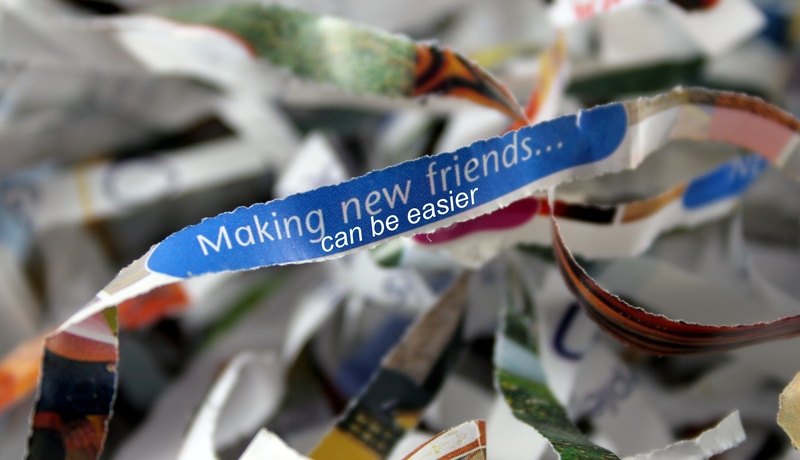 Making Friends Can Be Easier…Even for You! When my son first started attending his preschool, he would spend the car ride on the way “naming” friends. If he knew someone’s name, it meant that they were friends. For him there were two healthy categories: friends and people who aren’t yet friends. Those are two categories with which I can live – friends and not yet friends. Not only that, but it is a rubric for friendship that makes at least as much sense as most of the ones we employ in our adult life. We make and exclude friendships based on some very ridiculous ideas. Similar Ideological Adherence – We think we want friends who agree with us because we enjoy the regular feeding of our laziness and ego. We want to make friends who help us to remember how right we are. But we shouldn’t give into that idea. We shouldn’t make friends based on feeding our own sense of being right. That is not what friendship is about. Random Factor Fidelity – Our culture accepts as a valid reality friendships that are based on fidelity to particular entities that based predominantly on the random (in the sense of the universe, that is) location of our birth. Or, in far more simple terms, we like to be friends with people who like the same teams as us. But, by and large, we like the teams we like simply because of where we were born and how we were raised. Neither of these factors are anything that an individual can control. While there are exceptions to this idea, they are not the norm. Most people who like LSU have some ties to Louisiana. Most people who like the Red Sox are connected to Boston. And we ought to know by now the dangers of forming allegiances based on geography. Transitive Property Association – We often make friends with friends of friends. Great! This is a wonderful way to meet people. But again, this seems to be a random association with other human beings that collapses the possibility of new friendships outside ideological or geographical factors. People who are friends with our friends (who probably already like our same teams and agree with our ideologies) are only going to further uphold our own inflated egos. Of course, while these are intentionally over-worded in approximation of our ability to rationalize, the real problem is that the inverse of these three rubrics is normally true as well. We tend to dislike (or even think of as enemies) people who disagree with us, like different teams than us, and are enemies of our friends. This only makes sense if we think friendship exists to prop us up as we are. If we think of friendship as existing to help us grow (and wouldn’t it be amazing to realize that most of life exists to help us grow), then we should want to make friends with people who think differently than we do, who like different things than we do, and who are new to our lives. Better for us to learn to make our rubrics more simple and more sensible. Perhaps we could all take a cue from my son. How about we consider the people whose names we know as our friends? Even better, what if we consider the people whose names we don’t know as potential friends. And then, we could get over ourselves, hand out name tags, and learn to really embrace the world in the ways in which we were designed to do.